Morgan checking out a rare snowfall in our area of North Carolina. Whenever the Iditarod is mentioned, folks are curious to learn more about the race and the athletes, both canine and human. Of course, I am excited to tell them about my trips to the race starts in Alaska, what I know about it, and my upcoming trip for the 2011 race. The most frequently asked questions for me are: “Are you running a team in the race?” (No, I’m flying along the route during the race in bush planes. ); “How long is the race?” (Officially, it’s 1,049 miles, and the first mushers arrive in Nome around day 9 or 10. ); “Do you have a sled dog?” (Yes, I adopted a Siberian from our local shelter. ); and “Does she pull a sled?” (No, she pulls me on our very fast walks.) In the upcoming months, I’m visiting schools around North Carolina, public libraries, and 4-H to talk about the race and its use as an education tool. In the past year, I’ve spoken to Kiwanis and Rotary Clubs and retirement homes, too. You can bring Iditarod home to your community, too, through service leadership projects. Decorated with miniature booties and tags with checkpoint details, musher ornaments and information, and snowflakes. 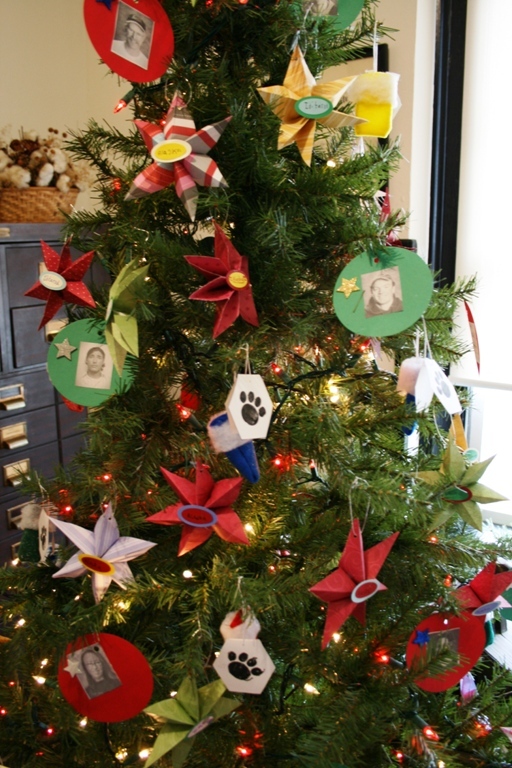 My students have a yearly opportunity to decorate Christmas trees in our local museum, and each year they decorate trees with an Iditarod theme. 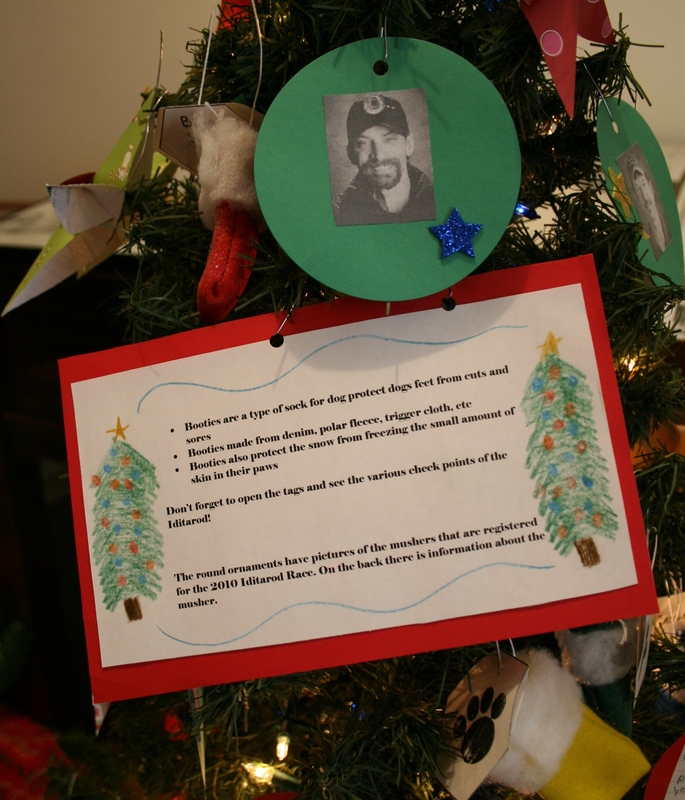 Sled dogs and sleds, musher ornaments, miniature sled dog booties, gifts with informative Iditarod gift tags under the tree serve to tell our community about the Iditarod Trail Sled Dog Race. Have your students practice research skills on the Internet to find information to put on their ornaments. Look at an earlier posting on this site to find pictures of a sled and dog you can use for an ornament pattern. One year my classes participated in the Books to the Trail project, bringing loose change to pay for Scholastic books we ordered. Students planned the purchase from a couple of book orders, determined to get the most books for the money. Visit www.iditarod.com and the For Teachers link to learn more about this project. 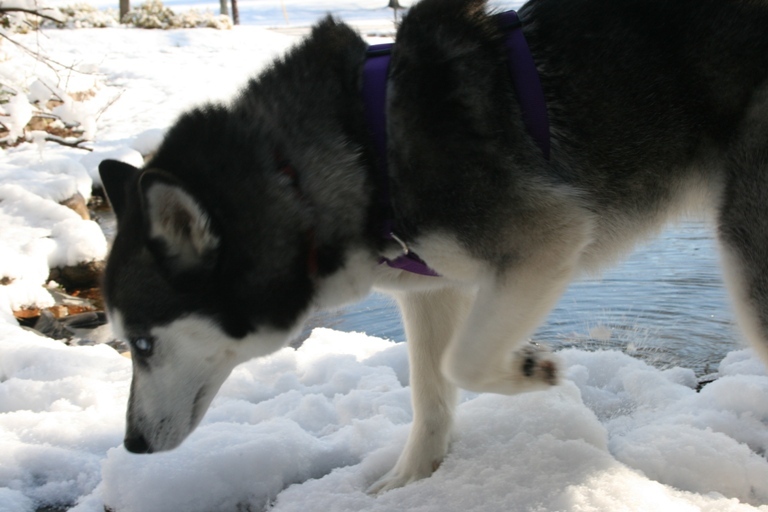 Zuma, the K-9 reporter for the Iditarod issues a service leadership challenge each year. Visit Zuma at www.iditarod.com and on Facebook at http://www.facebook.com/home.php#!/profile.php?id=1708954606. Serve animals in need in your area by collecting loose change to donate, or old clean towels, newspaper, or pet food. Your local animal shelters and rescue organizations may have other needs—check with them to see if office supply donations or other items are helpful to them. When you’ve finished your project, write it up and send it to djohnson@iditarod.com. Diane can get it posted on the Iditarod website for folks everywhere to read and be inspired by your work. Enjoy taking Iditarod to your community.